Food Costs > How Much Does Saffron Cost? Saffron is a spice that has a sweet taste and is used in many Arabic, Asian, Pakistani and other middle east countries. Found primarily in the Mediterranean, saffron spices can be found in your local Asian grocery store and larger grocery store chains. On average, a pack of saffron is going to cost anywhere from $5 to as much as $30 per pack. It’s going to depend greatly on the quality. 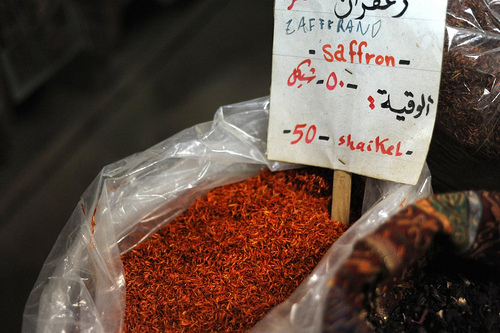 By the pound, saffron tends to be the most expensive spice on the market. Requiring more than 150,000 flowers to produce a kilo, the price of saffron can range from $500 to as much as $4,500 per pound. At whole and grocery store levels, saffron can cost about $15 to $25 for a small 0.06-ounce unit. For instance, McCormick has a Spanish saffron that comes in a 0.06-ounce unit, and it can cost anywhere from $13 to $22. According to an article on the UCC.edu website, retail prices for saffron can be as high as $315 per ounce or $5,040 per pound. CNN Money says this is the world’s most expensive spice, retailing for $1,000 or more. Saffron can either be sold as a thread or as a powder. Today, Iran is a major producer. They produce more than 90 percent of the world’s production. Once picked, saffron is immediately placed in air-tight containers. Saffron has a red tint based color that is slightly moist. Why is saffron so expensive? Coming from a crocus flowering plant, this flower will only bloom in the fall. Growing higher than two inches, the burnt-orange parts of the flower are used for the spice. The main expense comes from the labor and harvesting it for storage. Per flower, there are only three threads, and to obtain one pound, you would need 80,000 threads. To put it in perspective, 150 flowers would be needed to generate a single gram. What does saffron taste like? It has a subtle flavor and aroma, and many say it almost has a floral-like honey flavor. Saffron is going to come in two different forms: powdered and threads. Since saffron can be used to make a dish look more appealing, it’s best to know the two differences. Powered saffron should be the last type of spice that you should consider. The reason many avoid it is because you won’t know how pure it is unless you personally know the supplier supplying it to you. If you insist on getting powdered saffron, consider doing it yourself. Culinary experts prefer threads because the flavor tends to be stronger. To create a liquid base, add five tablespoons of water to a pot, and bring it to a boil, allowing it to sit in the pot. Leave it for a few minutes, and place it in a jar once it looks like a liquid. To add flavor, consider adding vinegar or even wine instead of water. Be sure to know where your spice has originated from. Each spice is going to have it’s own potency, so it’s best to follow the recipes to ensure that it has been used properly. It’s best to look for saffron that has been graded by the International Organization for Standardization (ISO.) This organization was formed to monitor the grade of saffron as it’s shipped. Saffron is best stored in a cool dry place that doesn’t have light. Make sure that you steer it clear away from any type of moisture. Aside from being used as a spice, it has also been noted to be possibly effective for Alzheimer’s disease, depression, menstrual discomfort and premenstrual syndrome. It can prevent diseases since it contains the compounds crocin and crocetin. Acts as an anti-depressant due to 5-hydroxytryptophan, which can boost the blood flow to the brain. Treats skin conditions such as acne. Used to treat conditions like whooping cough and asthma. Known to help during pregnancy. Able to help fight arthritis. Is able to protect against aging diseases such as cataracts and muscular degeneration. Known to be an anti-cancer. If you have a green thumb and are wondering if you can grow saffron, you may be pleased to know you can. To grow, you will first need to find a place that sells the saffron crocus bulbs. Amazon.com, for instance, has them available for $6 per 10 bulbs. You can also find them at reputable online nurseries. When you have the bulbs, you can plant them in your yard as you would any other bulb but do so in the fall since they will bloom during this time. Try to pick a spot with a lot of sun and well-draining soil. If it’s too moist, the bulbs may rot. Keep in mind they won’t grow the first year. When planting, plant the bulbs at least three inches in the soil and six inches apart. Over time, these flowers will multiply, so it’s ideal to have more than enough space to allow them to grow. Once planted, they require little to no maintenance. You can fertilize them annually if you wish, or you can water them if you receive less than an inch of water per week. If you know that you’re going to cook a lot of dishes, highly consider buying the spices in bulk. The more you purchase, the more you can save. The lower the quality, the less it’s going to be. Be sure to watch the price tag as you will find that the cheaper saffron may not be as good. If you don’t have the money to purchase saffron, consider other alternatives. These alternatives include annatto seeds, marigold blossoms, turmeric and safflower. All of these can have similar flavors at a fraction of the cost. SeriousEats.com will tell you if you see a few ounces for less than a few dollars, you will want to put it back. They note Iranian and Spanish saffron is a top choice.